Following a tradition of twenty nine years, the Organizing Commission of the Reading of the Year gathered on the 31st of December 2015 in the House-Temple situated on Avenida 10 de Octubre #1509, between Josefina and Gertrudis, Vibora, Municipality of 10 de Octubre, City of Havana, Cuba. 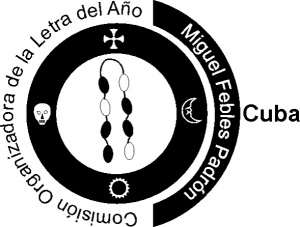 The Organizing Commission for the Sign of the Year “Miguel Febles Padrón” wishes you a Happy and Prosperous 2015 Year. Each person should go to their respective Godfathers (Babalawos) seeking clarity in regards to the upcoming information. This ceremony will be chaired by the oldest Ifá Priest and supported by Ifá priests respresenting all of Cuba’s Ifá families and their descendants in the rest of the World. The youngest Ifá priest will take out the sign Toyale. We will keep you informed all along the process, Ashé and benediction for all.